After Andrej, 12, his brother Tomas, 9, and baby sister Wilma escape the carnage that soldiers have wrought upon their parents and other members of their Romany caravan, they wander by night in search of food and other necessities, always fearing and avoiding the Leader's soldiers. One night, they wander into a village that has been totally demolished by bombs. Going through the rubble, looking for anything useful in the ashy remnants, they discover that the village zoo is still intact and decide it is a safe place to stop. It is the one place that is still intact, complete with soft, grassy lawn. 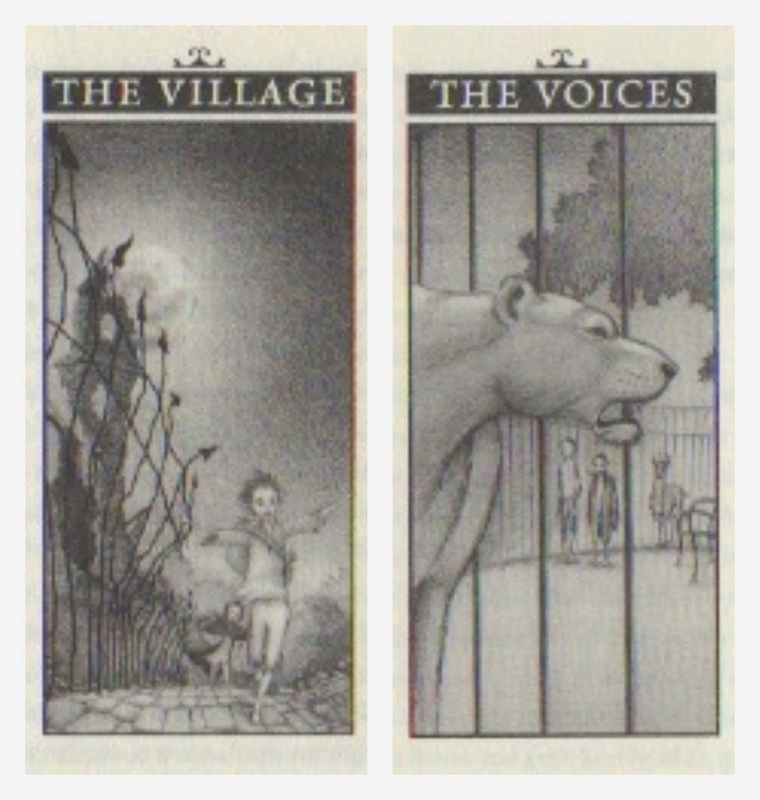 Curiosity gets the best of the boys and as they go from cage to cage, they discover the ten animals - a wolf, a lioness, a monkey, a seal, a kangaroo, an eagle, a chamois, a bear, a llama and a boar - are still alive, though they are a neglected, starving menagerie. But while they are exploring, planes flying overhead begin to drop bombs on the already ruined village once again. And when the planes leave, to be amazement of the boys, the animals start talking. As night unfolds, they tell the two boys about the zoo, the zookeeper and his daughter, Alice. Alice loved and cared for the animals but when the Leader's soldiers invaded their country, Alice became a resistance fighter. Within the safety of the zoo, she and the other resistance fighters planned a way to sabotage an enemy train. The sabotage was successful, but the Leader became very angry and took revenge on the village, continually bombing it even though nothing is left but the zoo. Alice had to go into hiding in the mountains, but promised the animals that she would return. As night wears on, each of the animals tell the boys how they came to be caged in the zoo. And the boys share their story with the animals. Each story is different, but each shares a common thread - loss of family, loss of freedom. I don't want to go into detail about their individual stories, because I think would spoil it for any future readers. They should be read not synopsized. The novel is always referred to as a WW2 story and it certainly sounds like one. Hartnett has said that she really hates the idea of having to tell the reader "everything in clunking detail," but it is easy enough to flush out details that correspond to events in the novel. The reference to the Leader reminds us that Hitler was also called der Führer (the leader). The fact that the boys are Romany places the novel in Eastern Europe, and the invaders remind us of the German soldiers who invaded Czechoslovakia. When Alice and her friends sabotage the enemy train, a close friend of the Leader is killed, a parallel of the killing of Hitler's friend and Gestapo head Reinhard Heydrich in Prague in 1942. Angered and wanting revenge, Hitler ordered the massacre of Lidice. I think that Hartnett deliberately kept these facts and events vague for two other reasons. First, she may have wanted this to be an ageless fable, not one that only relates to WW2, but to all conflicts. And second, because, as she said in an interview, she wants the reader to be "...part of the experience that is a book, and I like the reader to have some input into the creation of the work - to decide what happens in the end, if need be." 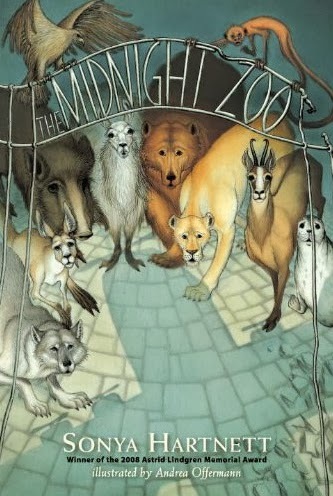 The Midnight Zoo is one of the most lyrically written books I have ever read. Hartnett masterfully combines realism , magical realism and personification to create an almost dream-like fable reminding us of the destructive nature of war. Accompanying the text are soft, almost ethereal black and white illustrations by Andrea Offermann at the beginning of each chapter, as you can see below, and full color cover illustration. Hartnett does not spare the reader any of the horrors of war in her descriptions. Knowing this, when I came to the end of the novel, I didn't not see it as hopeful or life affirming. At the end, when the figure of a woman in a dark cape appears, the children and animals see who they want to see, someone they believe will take care of them. For Tomas, she is his mother, for Andrej, she is Saint Sarah, patron saint of the Romany; for the animals, she is Alice. And when I thought back on the sentence "They had journeyed to the final edge of life beyond which there were no walls,"(pg 214) my initial reaction was that the planes had returned with their bombs and it was the moment of death when the woman called the children come and eagle prepares to fly, but it was also the moment when they have found true freedom in death. Maybe i missed it, but what was the name of the group who "...reminds us of the Germans...", i think it was something like Gadge? Thank you! This is a great analogy! Also, I did some thinking about what you said about the lioness having their mother's characteristics..... Do you think that maybe at the end of chapter three they go into a deep sleep/coma after the impact of the bombs, and the character's loved ones could be using the animals to communicate through the children's conscience? The children could decide to stay behind with the animals because they realised that the key to the animal's (and their own) freedom is, in fact, death? I actually believe that this book, the title, the story, and even the setting, could be a metaphor. This story, I think, is not just one night of their lives.